A Florida brewery is doing its part to protect the earth and marine mammals with its design of edible six-pack holders. We have posted this earlier but it merits posting again. Traditional plastic holders for beer and pop get wrapped and caught around marine mammals necks and bodies, often becoming lethal. Now Saltwater Brewery has designed six-pack holders that are edible for wildlife. 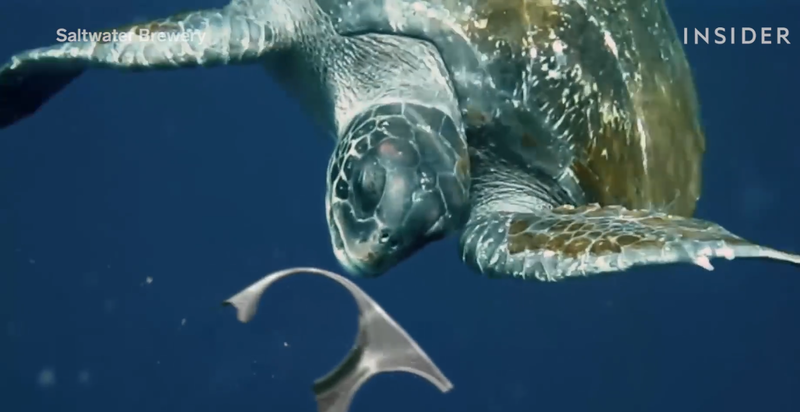 "Around the world, an estimated one million sea birds and 100,000 marine mammals and sea turtles become entrapped in plastic or ingest it and die," Mark Tokulka, a marine biologist, explains in the company video. Saltwater Brewery's six-pack rings are made from the byproducts of the beer making process, mostly barley and wheat remnants. So they are biodegradable and edible.